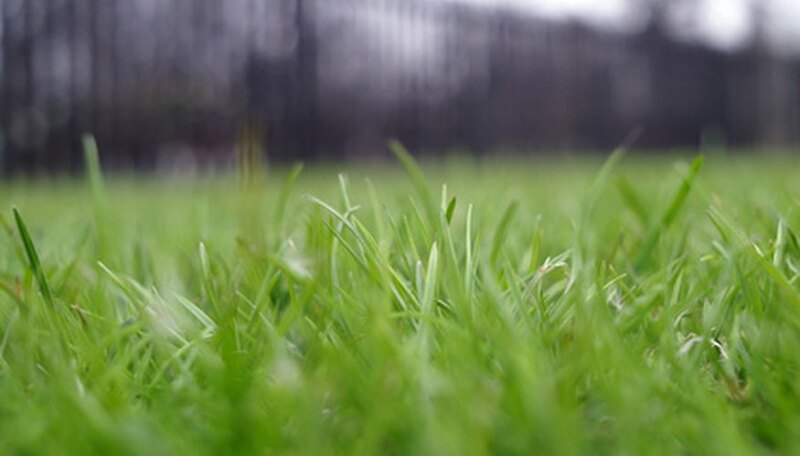 Few tiny green insects live in grass--most lawn bugs are darker in color or live underground. The tiny green bugs that infest your lawn could be leafhoppers, meadow spittlebug nymphs or grass mites. You can identify these insects by their physical characteristics and by the damage that they’re causing to your grass. Study the insects under a magnifying glass and compare what you see to photographs and descriptions of the bugs in an insect field guidebook. Identify leafhoppers by their wedge-like or triangular body shape. Leafhoppers are 1/5-inch long at most and appear to hop or fly short distances. Look for whitened patches of grass in your lawn with dead grass to identify a leafhopper infestation. You can find the tiny green leafhoppers attached to the grass stems and leaves. Spot meadow spittlebug nymphs, which are usually yellowish-green, infesting your grass. Find meadow spittlebug nymphs attached to the clover and weeds in your lawn, as well as the grass. The spittlebug nymphs are surrounded by a spittle-like liquid on the grass blades. Identify grass mites by looking for tiny, hard-shelled, eight-legged insects on the grass blades during the spring and fall. Some species of mites are greenish in color. Look for blotched, “stippled” and dead areas of grass to identify a grass mite infestation. The spittlebug nymphs look similar to leafhoppers, but they're hardier and tend to be slightly larger, up to 1/4-inch long. If you identify grass mites in your lawn, beware that these mites can end up inside your house. Mites that enter homes can infest your family, pets and houseplants.